At Netux our technical experts hand select our products on fact, not fiction. Other stores select products based on marketing hype; we take the time to evaluate the product based on its merits and performance. We don�t sell products that we, ourselves, wouldn�t use. We stand behind the products we choose to sell. Whether you simply have a question or need warranty assistance, we are here to help. We provided consistent value in the products and services we sell. Our prices are always extremely competitive. Unlike the �big box stores� we don�t jack up our prices just to have a �sale�. Our experts are here to help you find the products and services that meet your needs, without pressure or hassle. When you purchase a system from Netux we�ll install your software free of charge. Whether you�re a novice or an expert we are here to help! When you make a purchase at a �big box store� or online you are on your own when you walk out the door; that�s not the case at Netux. If you have any question, big or small, related to products and services purchased at Netux we�re available to help in the store, by phone, or via email. You will be surprised by our selection! We carry a wide variety of products from software to hardware, from computers to printers, from cables to accessories; we�ll help you find what you�re looking for. We carry a wide selection of Lenovo laptops, tablets, and desktops in addition to our custom built desktops. Choose from our selection of printers, ink, and media. If we don�t have the item you�re looking for in the store, we�ll check our warehouses and have it shipped. 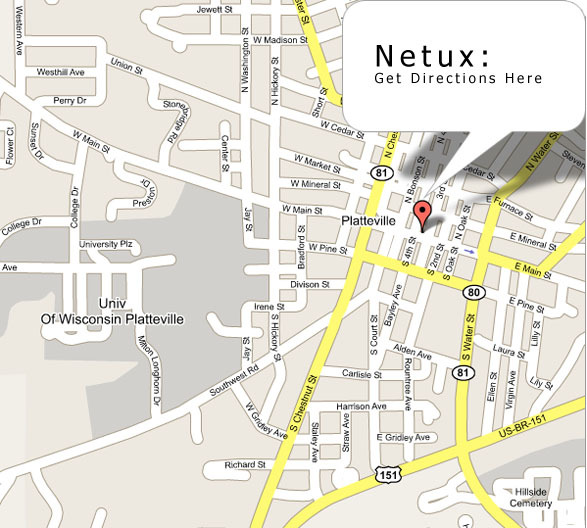 At Netux we offer efficient and affordable computer repair both in the store and at your home. We service laptops and desktops of every make and model. There is no need to schedule an appointment for in store service. We provide a wide variety of services, including: diagnostics, virus removal, data recovery and transfer, hardware and software installation, computer optimization, and much more. Most in store service is completed within one to three business days. We are located on Platteville's Historic Main Street.